For those who get excited reading census figures, I give you the results of the 1940 census as it pertains to Dallas County. 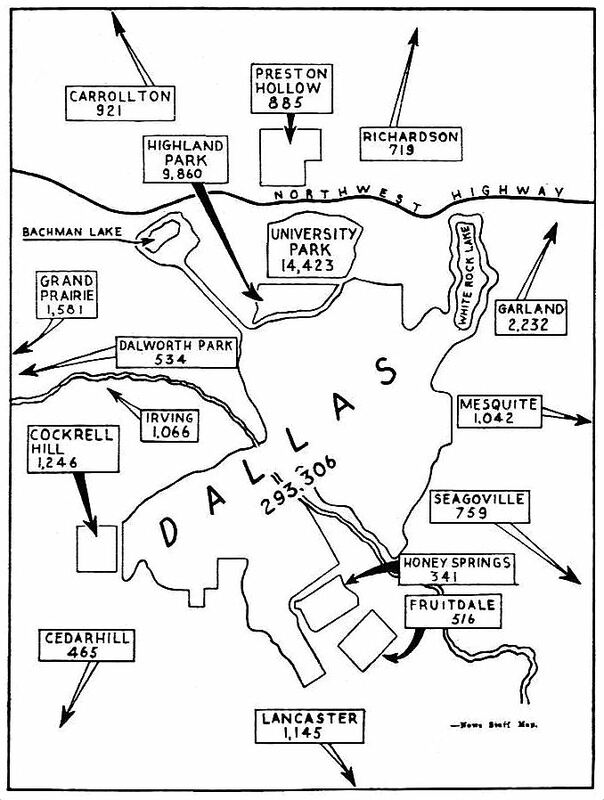 According to the Dallas Morning News article “12 Per Cent Gain Shown in City” (DMN, June 30, 1940), the population of Dallas County in 1940 was 398,049 in an area of 859 square miles; the density was 463 people per square mile. For some perspective, in 2010 the population of Dallas County was just under 2.4 million, with an area of 909 square miles — giving us a recent density of something like 2,700 people per square mile (and it’s only getting more cramped every day). Dallas County was big, but it wasn’t the biggest in the state in 1940 — that honor went to Harris County, with a population of 529,479; Bexar County came in third with 337,557. So which communities were the biggest winner and the biggest loser as far as population change since the 1930 census? They were the incorporated areas of University Park and Cement City. University Park had a whopping 243% gain in population since the 1930 census, and poor Cement City had a 200% plunge. Another interesting statistic (from the Census of Agriculture) showed that in 1940 Dallas County had 3,522 farms; in 1930 the county had 5,106. In 2012, the Census of Agriculture (in a PDF here) showed 839 farms (which is actually more than I would have guessed). The Dallas area was growing rapidly — even with a bit of a slow-down during the Great Depression — but the population growth following WWII was quite a bit more: the population in 1950 jumped to around 615,000 — an increase of more than 54%. After that, there was no looking back. For those who want to go the extra mile, the full breakdown of the census numbers can be found in the Dallas Morning News archives in the article cited above. It looks like the official numbers might have been changed a bit after the article cited above was printed. The very informative chart of Dallas County’s population through the decades (seen here) has the population a bit higher, at 398,564. More Dallas County stats — stats-a-plenty — at Wikipedia.